The parish of South Creake is situated in the west of Norfolk. 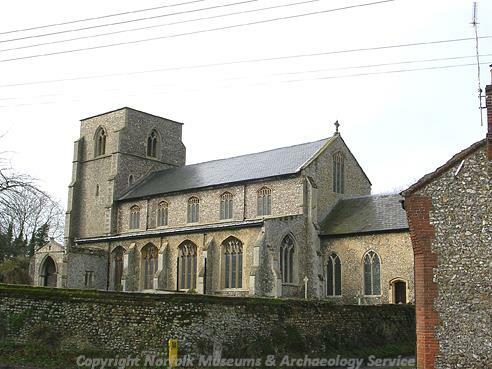 It lies northeast of Syderstone, west of Barsham, north of Dunton and south of North Creake and Great Walsingham. The name Creake derives from the Old Welsh phrase meaning ‘rock or cliff’ suggesting that the place is situated on a ridge. The parish has a long history and was certainly well established by the time of the Norman Conquest with its population, land ownership and productive resources detailed in the Domesday Book of 1086. This document states that after 1066 Hugh of Montfort held the parish lands. Numerous resources were also mentioned including a large number of sheep. A number of prehistoric sites have been identified in South Creake. Fieldwalking surveys have recorded several prehistoric pot boiler scatters (NHER 11329, 17358 and 24586), and these may well be the earliest sites in the parish. A narrow trackway of unspecified prehistoric date, known as the Norwich Long Lane trackway (NHER 2134), also runs through South Creake. In terms of small finds, a variety of prehistoric flint tools have also been found and these include a Palaeolithic handaxe (NHER 1933). However, the majority of these tools date to the Neolithic period and comprise axeheads (NHER 1936 and 22779), chisels (NHER 1938 and 1940) and an adze (NHER 19187). The only other Neolithic find apart from these tools takes the form of a quern stone (NHER 12466) that was ploughed up 450m southwest of South View. The Bronze Age seems to have been a busy period in South Creake. Aerial photographs have identified the cropmarks of several ring ditches (NHER 1971 and 11713) and ring ditch/barrow complexes (NHER 1946 and 11712). Two sword blade and axehead hoards (NHER 1944 and 1997) dating to this period have also been found. When coupled with the barrows these may suggest that South Creake was an important ritual landscape in the Bronze Age. In addition to these metal objects a couple of flint arrowheads (NHER 1945) and a flint axehead (NHER 18414) have been recorded. The most significant prehistoric monument dates to the Iron Age. The earthworks of a substantial hillfort exist atop Bloodgate Hill (NHER 1910) and this is one of only six prehistoric earthwork forts in Norfolk. Aerial photographs and geophysical investigations have established the layout of the fort, which comprises of a single banked and ditched enclosure with a large central ring ditch. Over the years a number of artefacts have been recovered from across the area of the hillfort including Iron Age pottery sherds, prehistoric flints, a human skull and seven Roman coins. The only other significant find from this era is a brooch (NHER 1071) that was found in the area of the deserted medieval settlement of Waterden. Two Roman roads run through South Creake (NHER 1791 and 1922). The first of these was discovered by probing in the River Burn which located a metalled surface (NHER 1922). The road has since been traced and it is metalled throughout. It runs across several parishes and originally went over the site of Barwick Hall. A long section of the other road (NHER 1791) runs through South Creake on its way to an unknown destination. It is a hollow way in some parts and in others it is only visible on aerial photographs. Some sections are still used as farm tracks, and parts of this road are now accessible through the National Cycle network. No other Roman sites have been recorded for the parish but a few Roman finds merit discussion here. A huge hoard of 1300-2000 silver Roman coins (NHER 1948) found in South Creake in 1799. No further information is available about this fantastic discovery but it is possible that some of the coins were acquired by Norwich Castle Museum in 1840. Of course, many other Roman coins have been found in isolation or smaller groupings (e.g. NHER 15732 and 28400). Other intriguing finds include a female figurine (NHER 15172) and a razor (NHER 28962). The best evidence for a Saxon presence can be found in All Saints' Church at Waterden (NHER 1976). The north chancel window and north and south nave clerestories are constructed in a Late Saxon style. These are the earliest features of the church and make it the only still standing Saxon monument. Several brooches characteristic of the Saxon period have been found by metal detecting, and these include a Middle Saxon Ansate brooch with ring and dot decoration (NHER 28962), a Middle Saxon nummular brooch (NHER 28242) and a Late Saxon disc brooch (NHER 1958). The only other noteworthy artefacts to have been found comprise a Middle Saxon strap end and Late Saxon bridle cheekpiece fragment recovered from a field to the east of Hall Farm (NHER 28242). The village of South Creake was not the only settlement in the parish during the medieval period. The earthworks of Waterden deserted medieval village are visible along the southeast of the valley, with further earthworks having been ploughed out to the northwest (NHER 1071). The manor house stood on the destroyed section to the west, and a picture of it in 1714 showed it with a Tudor porch-tower and tall chimneys. The deserted medieval settlement of Egmere also exists within the parish (NHER 1955). This settlement had a church dedicated to St Edmund, and the tower of this ruined building is still standing, with the site of the manor house located close to it. The settlement is recorded in the Domesday Book and had less than 10 households in 1449. Therefore it can be assumed that both Waterden and Egmere were abandoned due to a decline in the number of villagers, who were moving to larger urban centres by the end of the medieval period. Sadly, the medieval manor house of South Creake does not survive. The earthwork remnants of it (NHER 1017) have been identified on the playing field southeast of St Mary’s Church. Several other associated features have been identified including a disused watercourse with retaining banks, tofts and a hollow way to the southeast of the site. The fact that a map of 1630 refers to this location as the site of the manor of Bosshouse appears to confirm a manorial origin. St Mary’s Church in South Creake (NHER 1975) is a medieval foundation. The earliest feature of this church is the Norman stoup outside the porch but the majority of the fabric dates to the 13th and 14th centuries. Inside, there are several post-medieval brasses, a 15th century rood screen and pulpit along with various early medieval coffin slabs. The aforementioned All Saints’ Church in Waterden (NHER 1976) was well established by medieval times. The architecture suggests the church had fallen derelict by the late 16th century before a Jacobean patron rebuilt it. It has since undergone restorations/repairs in 1800 and 1895-1900. Inside, there are a number of high-quality 19th century furnishings. In addition to these two churches, several associated medieval burials have been found on New Road (NHER 30896) and at Church end (NHER 1954). Intriguingly, a medieval angel corbel (NHER 17211) has been built into one of the buildings of South Creake School. It is probably the one missing at the west end of the church nave interior and may have been removed when a west gallery was inserted into the church. A fragment of a medieval stone arch, also possibly from one of the churches, was found in the garden of Sambea Cottage (NHER 15532). No spectacular medieval artefacts have been found in the parish, with the selection retrieved including coins (e.g NHER 28962), pottery sherds (e.g. NHER 17146), seal matrices (NHER 17356), weights (NHER 13026) and buckle plates (NHER 13026). The post medieval period in South Creake was one of intense activity, with a large amount of building and manufacturing. The foremost buildings of this period are the farms that were built as part of the Holkham Estate. These include Waterden House and Farm (NHER 12173), which were built in the late 18th century and described by the writer Arthur Young as 'the finest farm buildings in Britain'. The L-shaped barn here is especially fine with its reused medieval stonework from the parish church, including corbels, angels and gargoyles. Another such farm is Leicester Square Farm (NHER 12175), which is of similar date and important because it is the only farm entirely designed by the celebrated architect Samuel Wyatt. The farmhouse has three bays and two storeys with a façade faced with tiles that imitate gault brick. The south quadrant terminates in a game larder, the north quadrant in a modern balancing block. The last of the Holkham Estate farms is Compton Hall Farm (NHER 21867), a so-called model farm because it was set out according to the ideal of what an effective farm should comprise. The farmhouse here has five bays with an advanced three bay centre and recessed single bay wings returned as separate three-bay houses to east and west. The original stables survive to the north but they have been converted to a cottage at the south end. The farm has a fine flint and brick barn range formed of three barns placed end to end. A number of windmills also existed in South Creake at this time. The most prominent of these was Whiscard’s Mill (NHER 5787 and 23312) which has a complex history. The mill appeared on an 1841 map to the west of the modern Foldgate Cottages (NHER 23312), where it stood until it was blown over in 1860 and sold in 1860. However, a map of 1797 also shows a mill presumed to be Whiscard’s some 200m west of the modern Winston Drive. Therefore it may have stood at this location (NHER 5787) prior to 1841 before it moved to the other site in 1841 (NHER 23312). Another mill recorded in the parish is Belding’s Mill (NHER 23275) which was sold in 1844. This mill stood in a field called Mayes, and a study of fields in the area show it to have been situated some 250m north of Meadow Rise. Other post-medieval manufacturing sites have been identified from Ordnance Survey maps and these include a marl pit and brick kiln (NHER 1933), a brick kiln (NHER 36182) and a lime kiln (NHER 15828). Of these only the remains of the lime kiln in a wooded area west of Crocker’s Lane survive. In the late part of the post medieval period there was also a brewery and maltings (NHER 42798) in South Creake. These were constructed around 1836, were modified to manufacture razor blades in 1925 and were converted to residential properties in 1987. During World War Two a couple of defensive structures were built in the parish. Aerial photographs taken in 1946 showed a searchlight battery (NHER 33743) to the east of Waterden Farm. A World War Two aircraft observation post also survives to the northwest of Hubbard’s Farm. The old Shooting Lodge (NHER 42753) of Earl Spencer, patron of South Creake, was also used as a Land Army Hostel in 1939-40 and as a headquarters for USAAF radar in 1944. Sadly, this building was demolished in 1960. The most recent archaeological record concerns a Cold War Royal Observer Corps orlit post (NHER 35429) situated next to the World War Two aircraft observation post. It was in use from 1961-91 as a seismic station to record nuclear explosions. The surface features are still intact and the interior still retains the carrier receiver, furniture and robotic equipment. Thomas Sunley (NLA) 6 June 2007.